For me, looking outside of Victoria when measuring up MBA programs wasn’t an option. I wasn’t willing to relocate and I personally felt that completing an MBA by correspondence wouldn’t have the same advantages. For one, I had completed my undergraduate course as an off campus student so I had missed out on the typical university experience. I felt that having contact hours would keep me accountable, allow me to immerse myself in the learning and meet new people. In short, I was after a holistic learning experience, in stark contrast of my self inflicted ‘let’s do as minimal as possible to get by’ undergraduate experience. 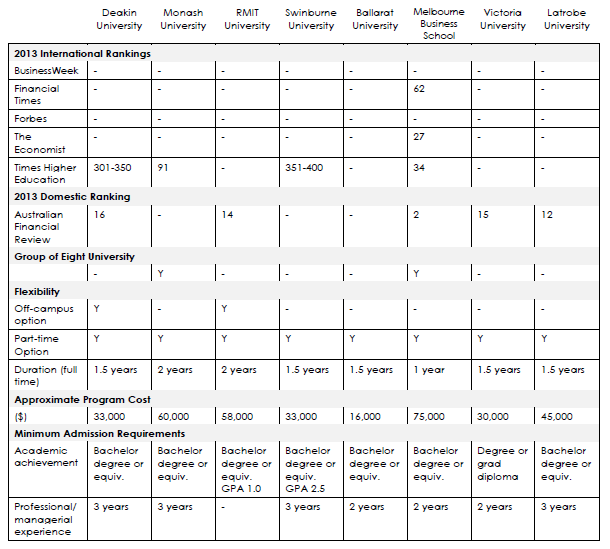 So I compiled a basic snapshot of the available MBA programs in Victoria. Whilst I have now enrolled in a part-time program, this information is based on the full-time MBA as that information was more readily available on the University websites. The information is current as at 2013 and of course, much more research would be required to make an informed decision such as various ranking methodologies etc, this was just my way of comparing some aspects that I personally considered. I think once you shortlist your options, it’s much easier and less time consuming to perform some in-depth research, both statistical and anecdotal.